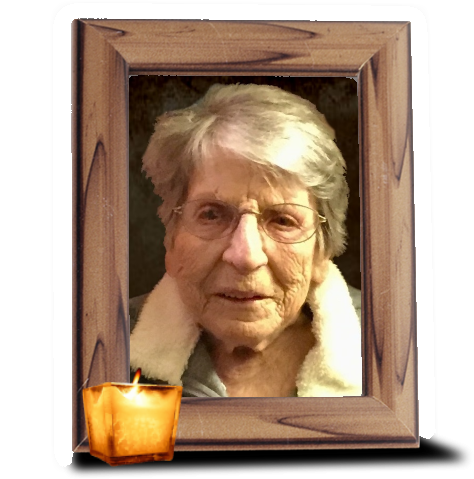 Obituary for Loretta E. Annoye | Wiesner & Massart, Inc.
Loretta Emma Annoye, 92, passed away peacefully on April 2, 2019 at Autumn's Journey Assisted Living, Algoma. She was born on October 18, 1926 to Alex and Victoria (Pinchart) Annoye at their family home located in the Town of Lincoln. Loretta attended Liberty School in Lincoln, WI. She grew up on her family farm with her parents and 7 siblings where she milked cows but was primarily responsible for cooking meals and making homemade bread for the family. Later in life she moved to Algoma and was employed in the housekeeping and laundry at the Algoma Memorial Hospital and later the Algoma Long Term Care Unit. Loretta was a natural caretaker and unselfishly cared for her mother, Victoria and brother, Vincent throughout their lives. She always put others needs before her own. Loretta spent countless hours in her flower and vegetable gardens which harvested enough to feed the entire neighborhood. She could often be found picking strawberries and raspberries only to give them to family and friends. Loretta also enjoyed playing cards, sewing and crocheting. Loretta is survived by her sister, Beverly Pierre and sisters-in-law, Helen, Ruth and Grace Annoye. Loretta is also survived by many nieces and nephews as well as great and great-great nieces and nephews. Loretta is reunited in Heaven with her parents Alex and Victoria Annoye as well as her brothers, Vincent, twin brother Stanley, Harry, Elmer, Roland, infant brother Bernard Annoye and sister, Lorraine DeGuelle. She was also preceded in death by in-laws, Francis Pierre, Harold DeGuelle, Martha and Vernal Annoye and a niece, nephew and great niece. Family and friends may gather at St. Mary's Catholic Church, Algoma, Saturday, April 6, 2019 from 9 a.m. to 11:00 a.m. Mass of Christian Burial at 11:00 a.m. with Fr. Alvan Amadi officiating. Burial at St. Peter's Catholic Cemetery in the Town of Lincoln with prayers by Fr. Edward Looney. Wiesner & Massart Funeral Homes is assisting the family with arrangements. Online condolence messages may be shared at www.wiesnermassart.com . The family extends a thank you to Jennie and her staff at Autumn's Journey Assisted Living and Unity Hospice for their care and compassion for Loretta over the last few months. Special thanks to Gabby and Crystal for taking the extra time with Loretta many evenings and for being there for her at the time of her passing. Thank you to Chey for her kindness while caring for Loretta and for our family the evening she passed. thank you to Tim Kinnard for his kindness in assisting the family and the handling of Aunt Loretta. Loretta will be dearly missed by her family and by all that knew her.